Have your gums become red, tender, or swollen? Do they bleed when you brush or floss? If so, you could have gingivitis, the first stage of gum disease. This condition, if left untreated, can lead to periodontitis, which erodes the supporting jawbone around the teeth. At the practice of Dr. Steven M. Balloch in Hartford, CT, we offer treatment for gingivitis as part of our dental care services. Here, we explore the various procedures that can keep your teeth and gums healthy for years to come. Every day, plaque accumulates on the teeth and around the gums. If these deposits are not routinely removed, the bacteria in the plaque can begin to irritate the oral soft tissues. Essentially, gingivitis is the body’s inflammatory response to irritants. In some cases, gingivitis can be triggered by hormone fluctuations. For instance, women are much more susceptible to this condition during puberty, pregnancy, and menopause. Fortunately, gingivitis is typically easy to treat, as long as it is diagnosed early. In fact, the condition can be completely reversed with a regular dental cleaning in most cases. During this visit, your hygienist will remove plaque, tartar, and other irritants, eliminating bacteria from the gums. As a result, inflammation is reduced, and the gums return to their normal, healthy, pink appearance. In addition, your dental team can help you develop a personalized oral care regimen to use at home between visits. If gingivitis is left untreated, the bacteria that were above the gum line will seep into the gums and begin to erode the underlying bone tissue. This condition is known as periodontitis. 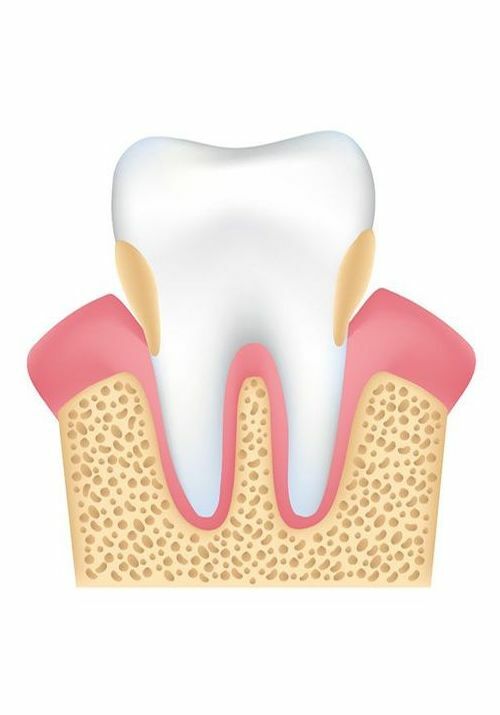 As a result, pockets form around the tooth roots, causing them to become loose. Further debris, plaque, and bacteria can accumulate in these pockets, perpetuating a harmful cycle. In fact, if periodontitis is not treated, it can result in tooth loss. Because periodontitis results in pockets around the teeth, it is impossible for a toothbrush or floss to reach that far into the gum line. Therefore, the bacterial infection that develops cannot be eliminated away with normal oral hygiene practices. In fact, a dental cleaning with your hygienist would not even be sufficient. In these cases, a deep dental cleaning, also called scaling and root planing, would be necessary to effectively treat the condition. During this procedure, the gums are numbed for your comfort. Next, your dentist or hygienist cleans below the gum line, eradicating tartar and plaque. Once the surfaces are clean, the dentist will smooth the tooth roots to deter further irritants from reattaching. The best way to prevent all forms of gum disease is to practice proper oral hygiene habits and attend all scheduled dental visits. While most dental patients can maintain healthy teeth and gums with six-month cleanings, others may require more frequent visits. This is especially true for individuals who are genetically predisposed to issues such as tooth decay and gum disease. During a consultation at our practice, we can develop a customized regimen to keep your teeth and gums healthy. If you are noticing the symptoms of gingivitis, it is important to have the condition evaluated as soon as possible. Doing so can halt the progression of gum disease and help you avoid costly, invasive treatments. To learn more, contact us online anytime or give us a call at (860) 659-8660.